As resident percussionist of the Jan Garbarek Group for 14 years, Marilyn Mazur enlivened every path set before her with dynamism and panache. 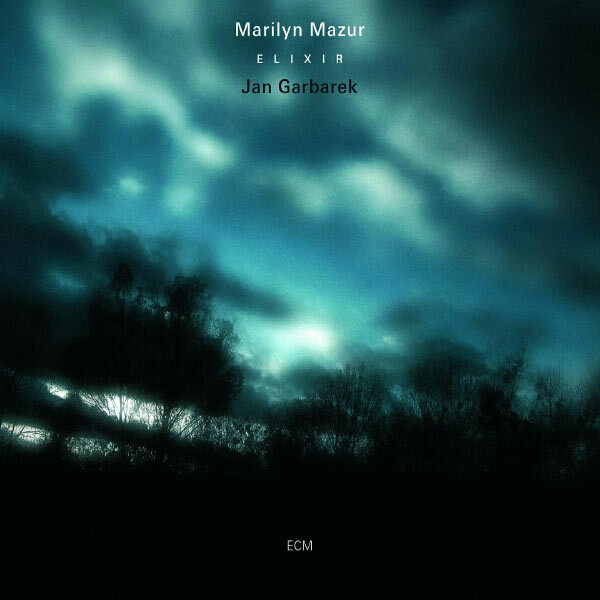 On Elixir, she delineates her own compass and invites Garbarek on a journey of organic play, thus yielding a composite sketchbook of improvised solos, duos, and multitracked collages. Each of the album’s 21 tracks is an iceberg’s tip. Only the penultimate “Winter Wish” exceeds four minutes, and with it the waterline. This and other such evocative titles as “The Siren In The Well,” “Mountain Breath” (which sounds like an eagle dreaming of a whale), and “Bell-Painting” afford imaginings for the wayward listener fortunate to wander into these territories. The latter title is especially appropriate, for Mazur is very much a painter whose palette is her instrument. From a kit that spans the globe, she chooses only the most appropriate pigment for each image. Be it the splash of a Chinese gong (cf. “Creature Walk” and “Talking Wind”), the pulse of hand on taut skin (“Mother Drum”), or the resonant metals of “Pathway,” she reverse engineers gold into its base components and treats each as if it were just as precious. Her solos speak to the heart because they speak to the earth: the two are one in the same. Her duets with Garbarek both open (“Clear”) and close (“Clear Recycle”) the program. The Norwegian saxophonist’s rasp brings out the light of Mazur’s subterranean designs and with it illuminates their innermost dances. Colors reveal themselves accordingly in the sheer variety of instruments. Whether by hang drum or waterphone, cymbals or flute, their groove magnifies the great within: foot to earth as soul to sky. Through them run the ley lines of the plains, singing and free. Like the track from which the album gets its name, they feed an incantation of which verses come and go like clouds, if only to remind us that the sky above never goes away, for that is where we will go when our bodies bend over in silence.